My skin isn't actually dry all over (infact its pretty oily) but sometimes it feels really tight and dehydrated. I often get really dry eyebrows, which sounds really weird but I mentioned that the Caudalie Thirst Quenching Serum had really helped add some much needed moisture back into my face. But it was so small and I'd already purchased another moisture mask. I decided to with the Origins Drink Up mask purely as the rest of my skincare is Origins and I wanted another treatment to go alongside the mask's I already use . I've been using this Origins Drink Up Mask once or twice a week for the past few weeks and its really helped improve the way my skin feels. My skin just feels fresher, softer and intensely moisturised. My skin literally "drinks up" all the moisture. 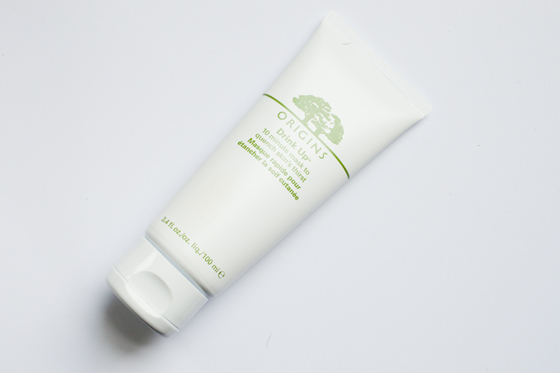 I found it really balanced out the drier areas of my face without making the oily areas worse. The cream itself is very thick and rich once applied with a natural fruity scent that doesn't smell synthetic at all. I LOVE the smell so much, it sort of like Apricots! Im sure your all sick of me banging on about Origins products but I can't sing their praises enough. I feel like most of them actually work, and I haven't come across one yet thats not lived up to my expectations or lived up to their claims. You can buy the Origins Drink Up mask in either a 10 minute moisture mask (the one I have) and a overnight treatment. I often leave the mask on for over the recommended 10 minutes as it really doesn't matter how long you leave it on. Skincare Disclaimer: I personally think skincare is incredibly subjective. I'd never run out and get something on the suggestion of one person. What works for me, may not work for you. I personally don't feel comfortable recommending skincare products, so all reviews are based on my own experiences with the product mentioned. Remember to look up other reviews and make sure you reference the reviewers skin type. My skin is Oily-Combination. I don't tend to get breakouts, but when I do they are on my chin. Also, cutting out dairy from my diet has also improved my skin of late.